"COX-1" redirects here. For mitochondrial cytochrome c oxidase subunit 1 (cox1), see MT-CO1. Cyclooxygenase 1 (COX-1), also known as prostaglandin G/H synthase 1, prostaglandin-endoperoxide synthase 1 or prostaglandin H2 synthase 1, is an enzyme that in humans is encoded by the PTGS1 gene. In humans it is one of two cyclooxygenases. There are two isozymes of COX encoded by distinct gene products: a constitutive COX-1 (this enzyme) and an inducible COX-2, which differ in their regulation of expression and tissue distribution. The expression of these two transcripts is differentially regulated by relevant cytokines and growth factors. This gene encodes COX-1, which regulates angiogenesis in endothelial cells. COX-1 is also involved in cell signaling and maintaining tissue homeostasis. A splice variant of COX-1 termed COX-3 was identified in the CNS of dogs, but does not result in a functional protein in humans. Two smaller COX-1-derived proteins (the partial COX-1 proteins PCOX-1A and PCOX-1B) have also been discovered, but their precise roles are yet to be described. Prostaglandin-endoperoxide synthase (PTGS), also known as cyclooxygenase (COX), is the key enzyme in prostaglandin biosynthesis. It converts free arachidonic acid, released from membrane phospholipids at the sn-2 ester binding site by the enzymatic activity of phospholipase A2, to prostaglandin (PG) H2. The reaction involves both cyclooxygenase (dioxygenase) and hydroperoxidase (peroxidase) activity. The cyclooxygenase activity incorporates two oxygen molecules into arachidonic acid or alternate polyunsaturated fatty acid substrates, such as linoleic acid and eicosapentaenoic acid. Metabolism of arachidonic acid forms a labile intermediate peroxide, PGG2, which is reduced to the corresponding alcohol, PGH2, by the enzyme’s hydroperoxidase activity. COX-1 promotes the production of the natural mucus lining that protects the inner stomach and contributes to reduced acid secretion and reduced pepsin content. COX-1 is normally present in a variety of areas of the body, including not only the stomach but any site of inflammation. COX-1 is inhibited by nonsteroidal anti-inflammatory drugs (NSAIDs) such as aspirin. Thromboxane A2, the major product of COX-1 in platelets, induces platelet aggregation. The inhibition of COX-1 is sufficient to explain why low dose aspirin is effective at reducing cardiac events. ↑ "Drugs that physically interact with Prostaglandin G/H synthase 1 view/edit references on wikidata". ↑ Yokoyama C, Tanabe T (December 1989). "Cloning of human gene encoding prostaglandin endoperoxide synthase and primary structure of the enzyme". Biochemical and Biophysical Research Communications. 165 (2): 888–94. doi:10.1016/S0006-291X(89)80049-X. PMID 2512924. ↑ Funk CD, Funk LB, Kennedy ME, Pong AS, Fitzgerald GA (June 1991). "Human platelet/erythroleukemia cell prostaglandin G/H synthase: cDNA cloning, expression, and gene chromosomal assignment". FASEB Journal. 5 (9): 2304–12. PMID 1907252. ↑ Bakhle YS (1999). "Structure of COX-1 and COX-2 enzymes and their interaction with inhibitors". Drugs of Today. 35 (4-5): 237–50. doi:10.1358/dot.1999.35.4-5.552200. PMID 12973429. ↑ Sakamoto C (October 1998). "Roles of COX-1 and COX-2 in gastrointestinal pathophysiology". Journal of Gastroenterology. 33 (5): 618–24. doi:10.1007/s005350050147. PMID 9773924. ↑ "Entrez Gene: PTGS1 prostaglandin-endoperoxide synthase 1 (prostaglandin G/H synthase and cyclooxygenase)". ↑ Chandrasekharan NV, Dai H, Roos KL, Evanson NK, Tomsik J, Elton TS, Simmons DL (October 2002). "COX-3, a cyclooxygenase-1 variant inhibited by acetaminophen and other analgesic/antipyretic drugs: cloning, structure, and expression". Proceedings of the National Academy of Sciences of the United States of America. 99 (21): 13926–31. doi:10.1073/pnas.162468699. PMC 129799 . PMID 12242329. ↑ Mulugeta S, Suzuki T, Hernandez NT, Griesser M, Boeglin WE, Schneider C (March 2010). "Identification and absolute configuration of dihydroxy-arachidonic acids formed by oxygenation of 5S-HETE by native and aspirin-acetylated COX-2". Journal of Lipid Research. 51 (3): 575–85. doi:10.1194/jlr.M001719. PMC 2817587 . PMID 19752399. ↑ Serhan CN (2005). "Lipoxins and aspirin-triggered 15-epi-lipoxins are the first lipid mediators of endogenous anti-inflammation and resolution". Prostaglandins, Leukotrienes, and Essential Fatty Acids. 73 (3-4): 141–62. doi:10.1016/j.plefa.2005.05.002. PMID 16005201. ↑ Wlodawer P, Samuelsson B (August 1973). "On the organization and mechanism of prostaglandin synthetase". The Journal of Biological Chemistry. 248 (16): 5673–8. PMID 4723909. ↑ Hamberg M, Samuelsson B (September 1974). "Prostaglandin endoperoxides. Novel transformations of arachidonic acid in human platelets". Proceedings of the National Academy of Sciences of the United States of America. 71 (9): 3400–4. doi:10.1073/pnas.71.9.3400. PMC 433780 . PMID 4215079. ↑ John H, Cammann K, Schlegel W (June 1998). "Development and review of radioimmunoassay of 12-S-hydroxyheptadecatrienoic acid". Prostaglandins & Other Lipid Mediators. 56 (2-3): 53–76. doi:10.1016/s0090-6980(98)00043-4. PMID 9785378. ↑ Bui P, Imaizumi S, Beedanagari SR, Reddy ST, Hankinson O (February 2011). "Human CYP2S1 metabolizes cyclooxygenase- and lipoxygenase-derived eicosanoids". Drug Metabolism and Disposition. 39 (2): 180–90. doi:10.1124/dmd.110.035121. PMC 3033693 . PMID 21068195. ↑ Frömel T, Kohlstedt K, Popp R, Yin X, Awwad K, Barbosa-Sicard E, Thomas AC, Lieberz R, Mayr M, Fleming I (January 2013). "Cytochrome P4502S1: a novel monocyte/macrophage fatty acid epoxygenase in human atherosclerotic plaques". Basic Research in Cardiology. 108 (1): 319. doi:10.1007/s00395-012-0319-8. PMID 23224081. ↑ Laine L, Takeuchi K, Tarnawski A (2008). "Gastric mucosal defense and cytoprotection: bench to bedside". Gastroenterology. 135 (1): 41–60. doi:10.1053/j.gastro.2008.05.030. PMID 18549814. ↑ Fauci AS, Braunwald E, Kasper DL, Hauser SL, Longo DL, Jameson JL, Loscalzo J, eds. (2008). Harrison's Principles of Internal Medicine (17th ed.). New York: McGraw-Hill Medical. p. 661. ISBN 978-0-07-146633-2. ↑ Parker KL, Brunton LL, Lazo JS (2005). Goodman & Gilman's The Pharmacological Basis of Therapeutics (11th ed.). New York: McGraw-Hill Medical Publishing Division. p. 1126. ISBN 0-07-142280-3. ↑ Weitz JI (2008). "Chapter 112. Antiplatelet, Anticoagulant, and Fibrinolytic Drugs". In Fauci AS, Braunwald E, Kasper DL, Hauser SL, Longo DL, Jameson JL, Loscalzo J. Harrison's Principles of Internal Medicine (17th ed.). New York: McGraw-Hill Medical. ISBN 978-0-07-146633-2. Richards JA, Petrel TA, Brueggemeier RW (February 2002). "Signaling pathways regulating aromatase and cyclooxygenases in normal and malignant breast cells". The Journal of Steroid Biochemistry and Molecular Biology. 80 (2): 203–12. doi:10.1016/S0960-0760(01)00187-X. PMID 11897504. Wu T, Wu H, Wang J, Wang J (2011). "Expression and cellular localization of cyclooxygenases and prostaglandin E synthases in the hemorrhagic brain". Journal of Neuroinflammation. 8: 22. doi:10.1186/1742-2094-8-22. PMC 3062590 . PMID 21385433. Jain S, Khuri FR, Shin DM (2004). "Prevention of head and neck cancer: current status and future prospects". Current Problems in Cancer. 28 (5): 265–86. doi:10.1016/j.currproblcancer.2004.05.003. PMID 15375804. Bingham S, Beswick PJ, Blum DE, Gray NM, Chessell IP (October 2006). "The role of the cylooxygenase pathway in nociception and pain". Seminars in Cell & Developmental Biology. 17 (5): 544–54. doi:10.1016/j.semcdb.2006.09.001. PMID 17071117. Diaz A, Reginato AM, Jimenez SA (May 1992). "Alternative splicing of human prostaglandin G/H synthase mRNA and evidence of differential regulation of the resulting transcripts by transforming growth factor beta 1, interleukin 1 beta, and tumor necrosis factor alpha". The Journal of Biological Chemistry. 267 (15): 10816–22. PMID 1587858. Takahashi Y, Ueda N, Yoshimoto T, Yamamoto S, Yokoyama C, Miyata A, Tanabe T, Fuse I, Hattori A, Shibata A (January 1992). "Immunoaffinity purification and cDNA cloning of human platelet prostaglandin endoperoxide synthase (cyclooxygenase)". Biochemical and Biophysical Research Communications. 182 (2): 433–8. doi:10.1016/0006-291X(92)91750-K. PMID 1734857. Vane JR, Mitchell JA, Appleton I, Tomlinson A, Bishop-Bailey D, Croxtall J, Willoughby DA (March 1994). "Inducible isoforms of cyclooxygenase and nitric-oxide synthase in inflammation". Proceedings of the National Academy of Sciences of the United States of America. 91 (6): 2046–50. doi:10.1073/pnas.91.6.2046. PMC 43306 . PMID 7510883. Mollace V, Colasanti M, Rodino P, Lauro GM, Nistico G (August 1994). "HIV coating gp 120 glycoprotein-dependent prostaglandin E2 release by human cultured astrocytoma cells is regulated by nitric oxide formation". Biochemical and Biophysical Research Communications. 203 (1): 87–92. doi:10.1006/bbrc.1994.2152. PMID 7521167. Inoue H, Yokoyama C, Hara S, Tone Y, Tanabe T (October 1995). "Transcriptional regulation of human prostaglandin-endoperoxide synthase-2 gene by lipopolysaccharide and phorbol ester in vascular endothelial cells. Involvement of both nuclear factor for interleukin-6 expression site and cAMP response element". The Journal of Biological Chemistry. 270 (42): 24965–71. doi:10.1074/jbc.270.42.24965. PMID 7559624. Ren Y, Loose-Mitchell DS, Kulmacz RJ (February 1995). "Prostaglandin H synthase-1: evaluation of C-terminus function". 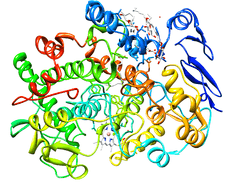 Archives of Biochemistry and Biophysics. 316 (2): 751–7. doi:10.1006/abbi.1995.1100. PMID 7864630. Picot D, Loll PJ, Garavito RM (January 1994). "The X-ray crystal structure of the membrane protein prostaglandin H2 synthase-1". Nature. 367 (6460): 243–9. doi:10.1038/367243a0. PMID 8121489. Kosaka T, Miyata A, Ihara H, Hara S, Sugimoto T, Takeda O, Takahashi E, Tanabe T (May 1994). "Characterization of the human gene (PTGS2) encoding prostaglandin-endoperoxide synthase 2". European Journal of Biochemistry / FEBS. 221 (3): 889–97. doi:10.1111/j.1432-1033.1994.tb18804.x. PMID 8181472. Otto JC, DeWitt DL, Smith WL (August 1993). "N-glycosylation of prostaglandin endoperoxide synthases-1 and -2 and their orientations in the endoplasmic reticulum". The Journal of Biological Chemistry. 268 (24): 18234–42. PMID 8349699. O'Neill GP, Ford-Hutchinson AW (September 1993). "Expression of mRNA for cyclooxygenase-1 and cyclooxygenase-2 in human tissues". FEBS Letters. 330 (2): 156–60. doi:10.1016/0014-5793(93)80263-T. PMID 8365485. Corasaniti MT, Melino G, Navarra M, Garaci E, Finazzi-Agrò A, Nisticò G (September 1995). "Death of cultured human neuroblastoma cells induced by HIV-1 gp120 is prevented by NMDA receptor antagonists and inhibitors of nitric oxide and cyclooxygenase". Neurodegeneration. 4 (3): 315–21. doi:10.1016/1055-8330(95)90021-7. PMID 8581564. Ballif BA, Mincek NV, Barratt JT, Wilson ML, Simmons DL (May 1996). "Interaction of cyclooxygenases with an apoptosis- and autoimmunity-associated protein". Proceedings of the National Academy of Sciences of the United States of America. 93 (11): 5544–9. doi:10.1073/pnas.93.11.5544. PMC 39283 . PMID 8643612. Hla T (January 1996). "Molecular characterization of the 5.2 KB isoform of the human cyclooxygenase-1 transcript". Prostaglandins. 51 (1): 81–5. doi:10.1016/0090-6980(95)00158-1. PMID 8900446. Mahida YR, Beltinger J, Makh S, Göke M, Gray T, Podolsky DK, Hawkey CJ (December 1997). "Adult human colonic subepithelial myofibroblasts express extracellular matrix proteins and cyclooxygenase-1 and -2". The American Journal of Physiology. 273 (6 Pt 1): G1341–8. PMID 9435560. Tsujii M, Kawano S, Tsuji S, Sawaoka H, Hori M, DuBois RN (May 1998). "Cyclooxygenase regulates angiogenesis induced by colon cancer cells". Cell. 93 (5): 705–16. doi:10.1016/S0092-8674(00)81433-6. PMID 9630216. 1fe2: CRYSTAL STRUCTURE OF DIHOMO-GAMMA-LINOLEIC ACID BOUND IN THE CYCLOOXYGENASE CHANNEL OF PROSTAGLANDIN ENDOPEROXIDE H SYNTHASE-1. 1igx: Crystal Structure of Eicosapentanoic Acid Bound in the Cyclooxygenase Channel of Prostaglandin Endoperoxide H Synthase-1. 1igz: Crystal Structure of Linoleic acid Bound in the Cyclooxygenase Channel of Prostaglandin Endoperoxide H Synthase-1. 1u67: Crystal Structure of Arachidonic Acid Bound to a Mutant of Prostagladin H Synthase-1 that Forms Predominantly 11-HPETE.